Fabris Yachts enters the superyachts bracket with the Stealth 80', a boat which has come about through the collaboration of Arrabito Naval Architects and Italtecnica, the former looking after the design of the hull and structure whilst the latter that of the interior. 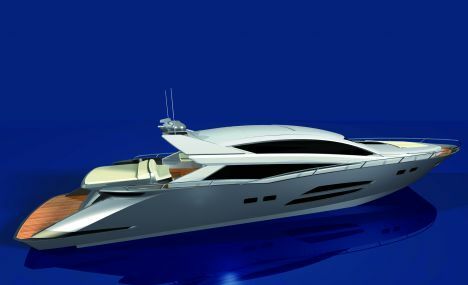 It is a yacht aimed at a sporty hence demanding public, for whom it offers the happy mix of MTU engines with Arneson ASD 15 transmission for enhanced high performance. The design highlights the sporty nature finding a pleasing blend between soft and clear cut shapes using the vast window panelling to encompass both whilst providing an all round particularly bright interior. Inside, the yacht is divided into common areas located on the main deck and sleeping quarters below, comprising a Master's suite amidships to include an area to relax in, a study, a walk-in wardrobe and bathroom. Three guest cabins a single, a double and a VIP in the bow area, complete the accommodation. The crew's quarters are in a separate area adjacent to the engine room and they include a twin cabin and a galley with an adjoining mess area. Along the inside of the superstructure on the main deck to starboard, in the bows we come to the wheel-house, which is fully equipped with all the possible instruments that could be required for difficult crossings, and moving towards the stern, on the same side there's an awaiting mess area; the saloon opposite, is duly fitted with sofas, tables and an multimedia games cabinet. This whole area may switch from pleasantly air-conditioned quarters to open air space thanks to a sliding hard top. The spacious cockpit outside is 'decked out' with an L shaped sofa, a dining area toward the stern together with a generously proportioned sun bathing space, like in the bow, where, deck-cushions and sun pads lie with another sofa. For further information please contact: Fabris Yacht; via Carlo Goldoni 68; 00042 Anzio (RM); tel. +39 06 9878247; fax +39 06 9878247. Declared Cruising Speed: 43 knots.